​Located just 3.5 miles from London City Airport and with easy access into central London (30 minute tube ride). Local attractions include the Royal Observatory, the Tate Gallery and National Maritime Museum. 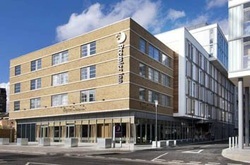 Premier Inn London Greenwich is 200 metres from Deptford Bridge DLR Station. On site parking available and there is an on-site restaurant serving fresh quality meals throughout the day. Book now for the best Premier Inn Greenwich deals.